Surgical management of moderate chronic ischemic mitral regurgitation (CIMR) is controversial. 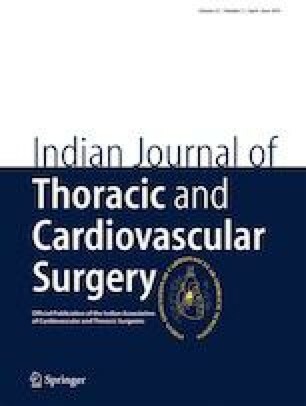 We propose a simplified classification of moderate CIMR based on regurgitant fraction (RF), ejection fraction (EF), and jet direction (central/eccentric) to predict left ventricle (LV) remodeling and identify patient subsets which need mitral valve (MV) repair along with coronary artery bypass grafting (CABG). In this prospective controlled study (n = 210), patients with moderate CIMR were randomized. Group I (n = 106) underwent off-pump CABG alone while group II (n = 104) underwent CABG + MV repair. The product of regurgitation fraction and ejection fraction (“RFEF”) was taken as a surrogate for myocardial reserve. The cut-off defined was 0.12; patients with RFEF ≤ 0.12 were categorized as the “bad” and those with RFEF > 0.12 as the “good” subset. The patients were further subdivided on the basis of their mitral regurgitation (MR) jet direction (central/eccentric). The percentage improvement in left ventricular end-systolic volume index (LVESVI) and MR grade were recorded 6 monthly. Analysis of the continuous variable “RFEF” in conjunction with jet direction was performed. At 12 months, the patient in good subset with central direction of jet showed improvement in LVESVI % in both groups (p = 0.428), while the patients in bad subset with eccentric direction of jet showed significantly higher improvement in LVESVI %, group II as compared to group I (p = 0.004). This study thus identifies “RFEF” as a surrogate for reverse remodeling capacity. In association with MR jet direction, predicts the subset of moderate CIMR patients most likely to have maximum LVESVI and MR grade reduction. This work was supported by U.N. Mehta Institute of Cardiology and Research Center itself and received no specific grant from any funding agency, commercial, or not-for-profit sectors. The study does not involve the use of any animal. And in case of patients, all procedures performed in studies involving human participants were in accordance with the ethical standards of the institutional and/or national research committee and with the 1964 Helsinki declaration and its later amendments or comparable ethical standards. Written informed consent has been taken from patients and none have been forced to be a part of the study.